Throughout its history, many people have written and spoken about the reputation, history, and political nature of the Jesuit Order. Find out what they have to say in this compilation of quotes from throughout history. “Jesuits, or Society of Jesus: A monastic order of the Roman Catholic Church, founded (1536) in Paris by Ignatius of Loyola. Originally the special function of the order was to care for the sick and to fortify the position of the Pope within the [Roman Catholic] Church. The latter function soon became the principal one of the order and thus it is not surprising that the order was approved by Pope Paul III as early as 1540, the first generalship being vested in the founder. By the time Ignatius died in 1566…his order had increased from 60 to more than 1000 members. The members had to vow not only chastity, poverty, and implicit obedience to authority…but, especially, compliance with the commands of the Pope in going to any country and under any conditions to convert heretics and infidels, especially Moors and Jews. …Their special obedience to the Pope naturally caused the Jesuits to fight against the greatest danger to the Catholic Church, Protestantism. Through this fight, the Jesuits developed political talents which soon made the members of the order the most versatile representatives of the Catholic Church in worldly affairs. In order to achieve this goal, a complicated organization of the utmost rigidity was developed. The Jesuits received the rights both of mendicant orders and of secular priests. They recognized only the superiority of [the Jesuit Superior General] and the Pope. This gave them great worldly power. Furthermore, from their inception they devoted much interest to education, and early in their history were appointed to many highly important chairs of theology at the leading universities of Europe. …Associated with all layers of society, from the humble to the powerful, the Jesuits combined great intellectual versatility and a shrewd political apprehension with a deep religious mysticism which was especially connected with the adoration of the Blessed Virgin. A certain soldierly spirit was furthered by the constitution of the order which provided severest punishment for members who did not comply with their vows. …The Jesuits tried also to restrain nationalistic tendencies everywhere and to emphasize the universality of the Catholic Church. Their missionary branch was no less important. Due to the fact that they [initially] worked principally in the Indies, Japan, China, and Abyssinia, the Jesuits’ spiritual work was often connected with the play of power politics. Thus they often played, directly or indirectly, a vital role in the political and economic conquest of the countries in which they served. …Flourishing particularly in Spain and Portugal, members of the [Jesuit] order were among the first to set foot on the Spanish and Portuguese colonies in America. 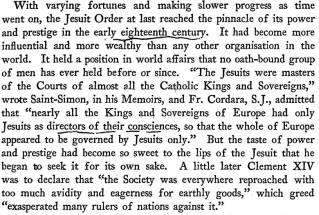 Their remarkable rise in power at European courts and among the people led many institutions of learning, their teachers, and the non-Jesuit clergy to fear the Jesuits. It was largely for this reason that the parliament of France resisted the Jesuits in their attempts to obtain a foothold. …By 1710, the order had more than 19,000 members and more than 22,000 by 1749. Increasingly feared and suspected by many European rulers, they were first driven out of Portugal (1759), and other countries followed suit. In France…they were finally expelled in 1764. Three years later Spain revoked its approval of the order. In 1773, Pope Clement XIV suppressed the entire Jesuit Order by a papal bull, but in 1814, it was restored by Pope Pius VII. …Later in the 19th century, however, the Jesuits were alternately driven out and permitted to exist in various European countries. They had to leave Italy in 1861, but were allowed to return in 1929. They were expelled from Germany in 1872, but permitted to exist there again after the fall of the Empire in 1918. In France the order was frequently expelled and restored after 1830 and finally permitted to return in 1919. England, Ireland, and the U.S., however, never passed any laws against the Jesuits. At present, the order totals about 25,000 members in 50 “provinces”, several of them in the U.S. However, the encyclopedia doesn’t tell the whole story. 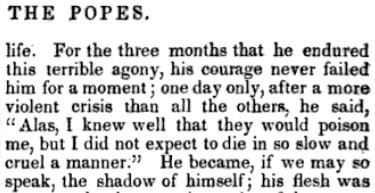 Only recently did the sentiments of caring for the poor become advertised as the Jesuits’ main purpose, and as we can see by the following quotes, the Society of Jesus has a darker and most sinister past. Pope Clement XIV laments his impending death caused by Jesuit strategizers. [Courageous Mexican President Benito Pablo Juarez] was the most dreaded enemy of the Society of Jesus while hating the Temporal Power of the Papal Caesar in Rome. He…expelled 200 JESUIT priests…In 1872 he died at his desk, a victim of ‘the poison cup’. Jesuitism is the power behind the Papal throne. “The presence of the Jesuits In any country, Romanist or Protestant,” once remarked Lord Palmerston, ” Is likely to breed social disturbance.” So hurtful was the Jesuit Order found to be that, up to 1860, it was expelled no fewer than seventy times from countries which has suffered from its machinations. The assassins of St. Bartholomew, the inquisitors and the Jesuits are monsters produced by malignant imaginations; they are the natural allies of the spirit of darkness and of death; the religion of Christ, entirely to the contrary, is the sublime revelation of the life and of the light. The society of Jesus is the enemy of man. The whole human race should unite for its overthrow. Earth and heaven should rejoice together over its tomb.—For there is no alternative between its total extirpation, and the absolute corruption and degradation of mankind. They are Jesuits. This society of men, after exerting their tyranny for upwards of two hundred years, at length became so formidable to the world, threatening the entire subversion of all social order, that even the Pope, whose devoted subjects they are, and must be, by the vow of their society, was compelled to dissolve them [Pope Clement suppressed the Jesuit Order in 1773]. 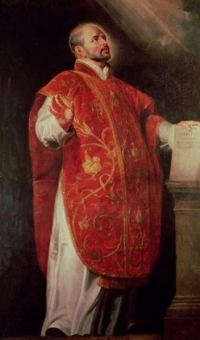 They had not been suppressed, however, for fifty years, before the waning influence of Popery and Despotism required their useful labors, to resist the light of Democratic liberty, and the Pope [Pius VII] simultaneously with the formation of the Holy Alliance,  revived the order of the Jesuits in all their power…they are a secret society, a sort of Masonic order, with super added features of revolting odiousness, and a thousand times more dangerous. Throughout Christendom, Protestantism was menaced by formidable foes. The first triumphs of the Reformation past, Rome summoned new forces, hoping to accomplish its destruction. At this time the order of the Jesuits was created, the most cruel, unscrupulous, and powerful of all the champions of popery. Cut off from earthly ties and human interests, dead to the claims of natural affection, reason and conscience wholly silenced, they knew no rule, no tie, but that of their order, and no duty but to extend its power. The gospel of Christ had enabled its adherents to meet danger and endure suffering, undismayed by cold, hunger, toil, and poverty, to uphold the banner of truth in face of the rack, the dungeon, and the stake. To combat these forces, Jesuitism inspired its followers with a fanaticism that enabled them to endure like dangers, and to oppose to the power of truth all the weapons of deception. There was no crime too great for them to commit, no deception too base for them to practice, no disguise too difficult for them to assume. Vowed to perpetual poverty and humility, it was their studied aim to secure wealth and power, to be devoted to the overthrow of Protestantism, and the re-establishment of the papal supremacy. When appearing as members of their order, they wore a garb of sanctity, visiting prisons and hospitals, ministering to the sick and the poor, professing to have renounced the world, and bearing the sacred name of Jesus, who went about doing good. But under this blameless exterior the most criminal and deadly purposes were often concealed. It was a fundamental principle of the order that the end justifies the means. By this code, lying, theft, perjury, assassination, were not only pardonable but commendable, when they served the interests of the church. 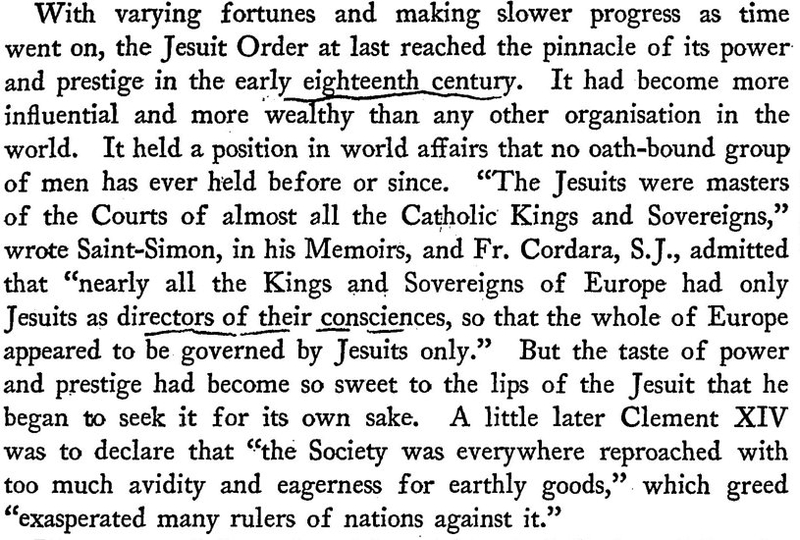 Under various disguises the Jesuits worked their way into offices of state, climbing up to be the counselors of kings, and shaping the policy of nations. They became servants to act as spies upon their masters. They established colleges for the sons of princes and nobles, and schools for the common people; and the children of Protestant parents were drawn into an observance of popish rites. Such were the means which Rome had invoked to quench the light of the Reformation, to withdraw from men the Bible, and to restore the ignorance and superstition of the Dark Ages. But under God’s blessing and the labors of those noble men whom he had raised up to succeed Luther, Protestantism was not overthrown. Source: E. Boyd Barrett, The Jesuit Enigma (New York: Boni and Liveright, 1927): 209…. The Thirty Years’ War, 1618-1648, was a series of conflicts that became the last great struggle of religious wars in Europe. It was fought almost exclusively on German soil…but before the war ended, it involved most of the nations of Europe. The underlying cause of the war was the deep-seated hostility between the German Protestants and German Catholics – with the Jesuits and Cardinal Richelieu, who was the real ruler of France, fanning the fires to accomplish their end. …The sixth and last event to be considered is the barbarous Irish Massacre, with its 23 October 1641 launching date – the date that also celebrates the Catholic feast of Ignatius Loyola, founder of the Jesuits. …For the unbiased researcher, history reeks of the butchery of Romanism, where whole cities and populations were unmercifully wiped out, just because they worshipped God in a manner that was different from Roman Catholicism. The Jesuit Order – a.k.a. the Society of Jesus, the Order of Jesus, the Sons of Loyola, and “the Company” (it was once called “the Company of Jesus”) – was founded in 1534 by Ignatius Loyola. It was officially recognized as a Roman Catholic religious order by Pope Paul III in 1540. Jesuits are famous as educators, and as “father-confessors” to emperors, kings (and their mistresses), queens, princes, princesses, high-ranking military officers, and many of the powerful and wealthy elite of the world. Jesuits are also infamous as seducers of women in the confessional, murderers of kings, makers of sedition, organizers of coup d’états, infiltrators of Protestant denominations, instigators of massacres, and fomenters of wars and revolutions. Numerous books have been written about the Jesuit Order. Some of these books contend that many of the men at the higher levels of the Jesuit Order have been – and are – very evil men! Source: Theodor Griesinger, Andrew James Scott (trans. ), The Jesuits (G.P. Putnam’s sons, 1883): 256…. …the whole frightful responsibility for this terrible thirty years’ war must rest upon the Emperor Ferdinand II., and his teachers, rulers, and bosom friends, the sons of Loyola. They [i.e., the Jesuits] have so constantly mixed themselves up in court and state intrigues that they must, in justice, be reproached with striving after world dominion. They cost kings their lives, not on the scaffold, but by assassination, and equally hurtful as the society of Illuminati; they were the foremost among the crowd, at all events, who applauded the murder scenes in Paris. The Roman Inquisition…had been administered since 1542 by the Jesuits. Between 1555 and 1931 the Society of Jesus was expelled from at least 83 countries, city states and cities, for engaging in political intrigue and subversion plots against the welfare of the State, according to the records of a Jesuit priest of repute…Practically every instance of expulsion was for political intrigue, political infiltration, political subversion, and inciting to political insurrection. The Church to rule the world; the Pope to rule the Church; the Jesuits to rule the Pope – such was and is the program of the Order of Jesus. …the favorite policy of the Jesuits, that of assassination. The Jesuits are the only religious order in the Church of Rome—and these orders are very numerous—which has lain under the ban of the [‘White’] Pope, or which has been expelled from any country because of its interference in politics. Hence we may expect to find that to obtain political power forms a main feature in the plans of the Society [of Jesus]. They’re the ones in the government. They’re the ones behind professional sports. The owner of the Pittsburgh Steelers (in 2000) is a Knight of Malta. The owner of the Detroit Lions (in 2000) is a Knight of Malta. All your top owners of these ball clubs, for the most part, are Knights of Malta, getting the people whooped up in this hoopla over games and sports, while they’re busy creating a tyranny. [Jesuit-trained Illuminist Adam] Weishaupt and his fellow Jesuits cut off the income to the Vatican by launching and leading the French Revolution [1789-1799]; by directing Napoleon’s conquest of Catholic Europe; [and] …by eventually having Napoleon throw Pope Pius VII in jail at Avignon until he agreed, as the price for his release, to reestablish the Jesuit Order. This Jesuit war on the Vatican was terminated by the Congress of Vienna and by the secret, 1822 Treaty of Verona.